How do I view catalog reports? 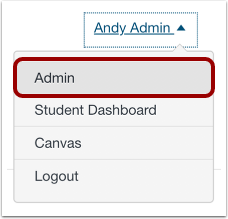 As a Catalog admin, you can view all reports in Canvas Catalog on the Reports page. 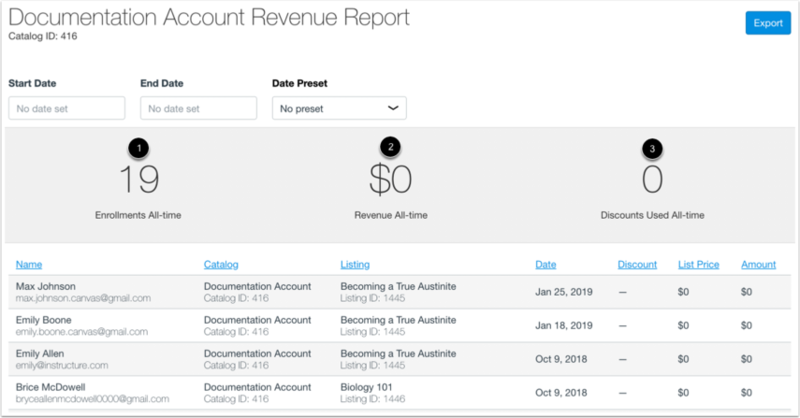 The Reports page shows an overview of all catalog enrollments, revenue, and discounts for each account. You can also view enrollment details for a specific account. Note: Enrollments that are not added to a course through the Catalog enrollment page are not included in catalog reports. The report will show the Catalog , number of Enrollments , Revenue , and number of discounts applied to the account . Catalog information includes Catalog Name and Catalog ID. To export the report, click the Export button . To view enrollment details for a catalog, click the name of the catalog. 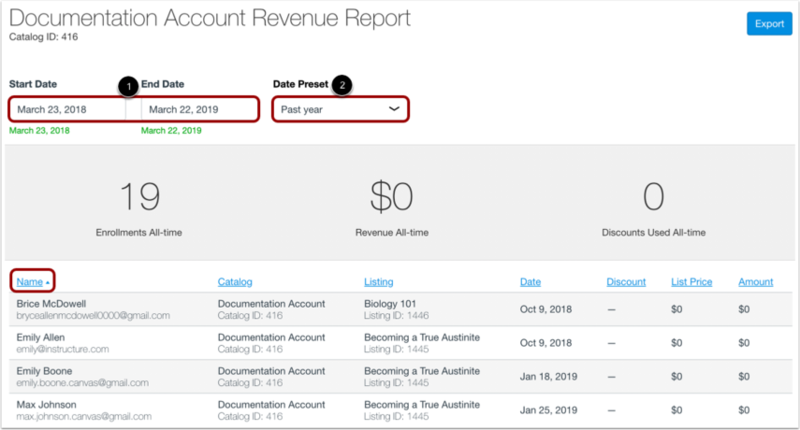 You can view an overall summary for the catalog, including the number of all-time enrollments , all-time revenue , and all-time discounts . Enrollments are ordered with the most recent transaction. The body of the report displays the specific enrollment details for the account. Enrollment details include student name , account , the listing where the student enrolled , date of enrollment , whether or not a discount was applied , the price of the listing , and the total amount paid . To export the catalog report, click the Export button . 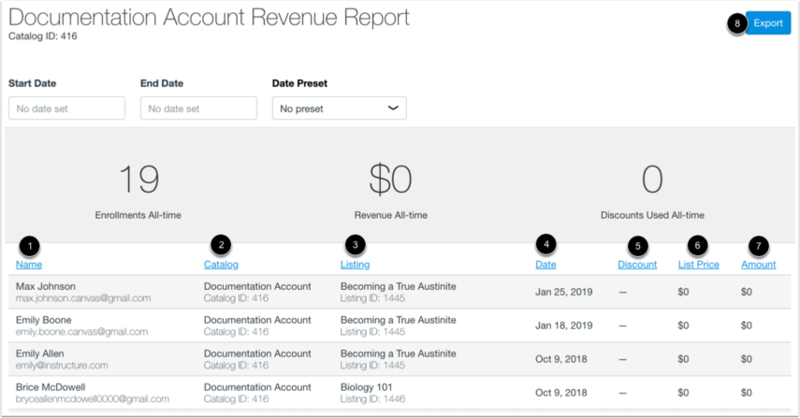 You can filter report details by date and sort report details by column headers. To filter report details by date, enter a start date and end date in the Start Date and End Date fields . You can also select a date preset from the Date Preset drop-down menu . To sort report details by a specific column, click the column header . This will sort the column in descending order. To sort in ascending order, click the column header again. Previous Topic:How do I add a catalog promotion? Next Topic:How do I export catalog reports? Table of Contents > Admins - Catalog > How do I view catalog reports?